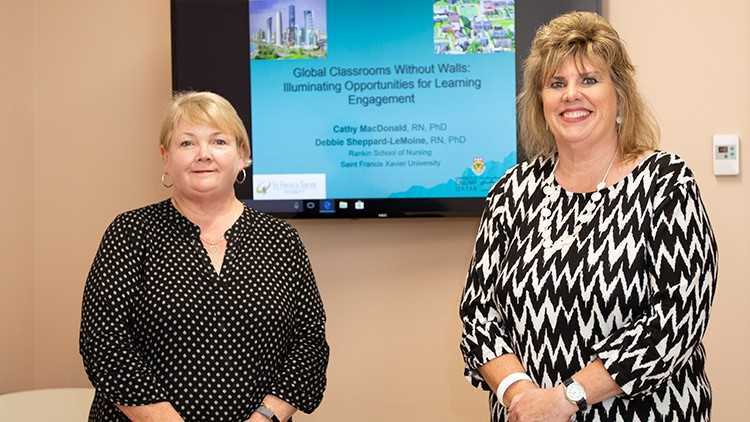 StFX Rankin School of Nursing faculty Dr. Debbie Sheppard-LeMoine and Dr. Cathy MacDonald have been singled out for honours for a paper that details their creative approach to shared global learning. The two received the Session’s Best Paper Award (Health Care & Bio Medicine1), presented in Orlando, Florida at the 9th International Multi Conference on Complexity, Informatics and Cybernetics/International Conference on Society and Information Technologies. Their paper, Virtual Global Classrooms Without Walls: Collaborative Opportunities for Higher Learning Engagement, has also been published in the Journal of Systematics, Cybernetics & Informatics. Vol. 16; Number 1. “In this paper, we shared our creative pedagogical approaches using synchronous communication implementing video conferencing,” Dr. Sheppard-LeMoine says. “Our example focused on a shared teaching/learning experience that was facilitated for the undergraduate BScN nursing students in Doha, Qatar and StFX Rankin School of Nursing in Antigonish,” she says. The focus was on building understanding of community practices in both countries. Opportunities were also offered at the graduate level for Middle Eastern students in the areas of palliative care and leadership. She says video technology that StFX supported in a large classroom brought together students in a shared learning experience. Both she and Dr. MacDonald say that this work provides not only an opportunity for future higher learning engagements, but also a foundation for future global collaborative research and practice partnerships. “We were humbled that our paper was selected as the best in a session with researchers and academics from around the world,” Dr. Sheppard-LeMoine says.